LAW OFFICE OF HAROLD F. MOODY, JR., P.C. The Law Office of Harold F. Moody, Jr., P.C. is a full service, general practice law firm located in the historic district of Plymouth, Massachusetts. 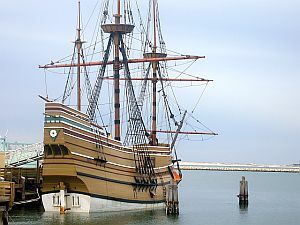 The Winslow-Warren Building (circa 1726), just one block from legendary Plymouth Rock, houses the firm’s offices. The firm’s practice centers around real estate law (including 1031 like exchange transactions, land use, title claims defense, zoning, development, leasing and commercial and residential transactions), business law (asset purchases, business organization, contracts, litigation, and small business representation), estate planning (wills, trusts, powers of attorney, health care proxies and probate administration) and serious personal injury matters (wrongful death, auto, boat and construction accidents). Our many years of experience allows us to thoroughly represent our client’s interests. Your initial consultation is always free. This office can provide the experienced, prudent representation you deserve. 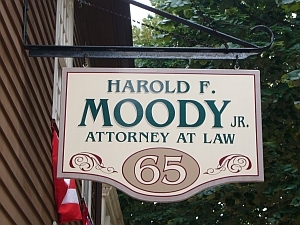 The Law Office of Harold F. Moody, Jr., P.C. is dedicated to providing attentive and effective legal services to its clients. It is the sincere belief of the firm that our vast experience and dedication to customer service allows The Law Office of Harold F. Moody, Jr., P.C. to most effectively and efficiently serve its clients. Attorney Moody served as an elected member of the Duxbury Planning Board for five years and handles title claims on behalf of a national title insurance company. He has literally handled hundreds of closings (both residential and commercial) over his twenty years of practice. Whether representing a buyer, a seller, a developer, or a lender his experience is invaluable in affording real estate clients unparalleled, quality representation. His experience in the Land Court can help you navigate through the thicket of any title (actions to quiet title, reformation actions, S-petitions) or zoning issues. Leases, foreclosures, realty trusts and land use permits are all within the umbrella of his experience and knowledge. Years of business experience allows the office to provide small businesses with the legal advice needed to succeed. Whether choosing the structure that best suits a business venture (and drafting specific documents to effect that choice), drafting and/or reviewing contracts (including asset purchase agreements, leases, franchise agreement or sales agreements) or representing businesses in court matters (litigation) The Law Office of Harold F. Moody, Jr., P.C. can provide the high quality representation needed to help businesses succeed. The firm also represents individuals and families for estate planning and probate administration. The prudent individual will seek counsel and pursue the peace of mind that “putting your affairs in order” can bring. Talk to Attorney Moody today regarding a durable power of attorney, a health care proxy, a living will and your last will and testament to maximize your estate tax prevention and provide your family with the legal tools to manage its affairs in difficult circumstances. Years of trial experience also enable The Law Office of Harold F. Moody, Jr., P.C. to protect families and individuals interests in the trying times that serious personal injury matters cause. Our office has strong relationships with affiliate firms whose expertise will provide your family the best representation for dire circumstances. Our emphasis on customer service affords our clients a level of comfort and assurance from the initial stages of representation through its conclusion. That same emphasis on customer service affords us to provide the personal touch so often missing from a large law firm practice. The use of modern computer and information technology allows the office be on the cutting edge of today and tomorrow’s effective legal representation.